Teacher Nancy Mueller, pictured right, led Winton Elementary School students as they danced and stretched to Gloria Gaynor’s 1970s disco hit, “I Will Survive,” Sunday on the North Idaho College campus. Mueller and the students led participants in the Susan G. Komen Race for the Cure through a lively warm-up session before the 5K run and 1-mile walk. Pictured left, Nathan Spellman, 8. Nancy Mueller is undergoing cancer treatments right now. But she’s not giving up, not when she’s this close. 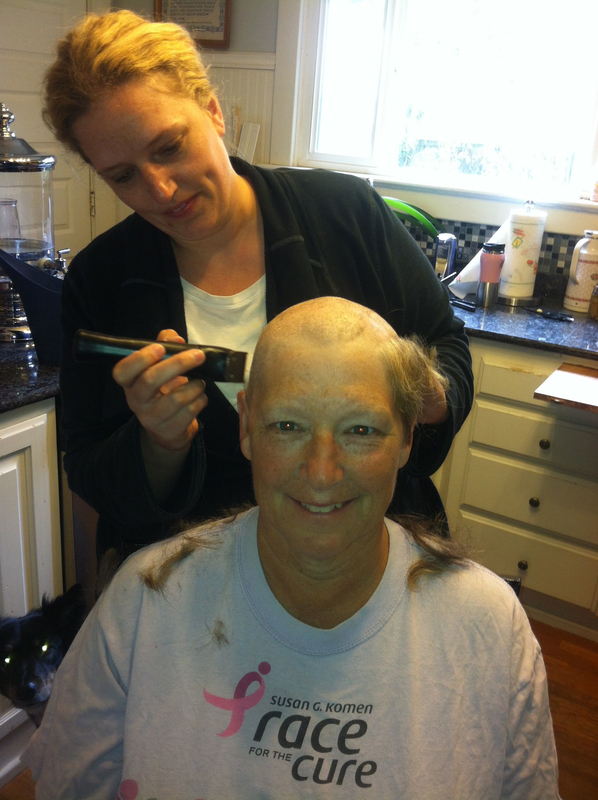 In fact, she will finish her last cancer treatments three days before the 13th annual Coeur d’Alene Race for the Cure. Mueller plans on participating as a volunteer and a cancer survivor at the event, taking place on Sept. 23 at NIC. Like many years prior, Mueller will lead a group of her students from Winton Elementary in a warm-up before the race. “I look forward to being able to do this again with whatever energy I can muster,” said Mueller. Last January, not even a year ago, Mueller found a tender spot on her left breast. When the spot had not healed by February, she knew, as a volunteer of Race for the Cure and as an educator, she had to schedule a mammogram right away. The same day they performed a mammogram, they scheduled her for an ultrasound. Less than a month later, she was diagnosed with invasive ductal carcinoma and was preparing for her first cancer surgery. For the kind of cancer she was diagnosed with, chemotherapy and radiation would be the best forms of treatment to combat the cancer, according to her doctor. Succumbing to a negative mindset was never an option for Mueller. “From the onset of this journey I told my family this was not going to make me depressed and feel sorry for myself. I have never once asked, ‘Why me?’ Instead I have wondered the reason for being picked for this journey and how I can use it to help others,” Mueller said. For Mueller, the best form of medicine came in prescriptions of “positive energy, humor and laughter.” “I’ve always believed those things can help a person through anything,” Mueller said. Telling her students at Winton Elementary about the cancer, where she teaches physical education and music, was a great challenge, especially with the many student age groups. A book on educating children about cancer called “The Hope Tree” gave her the answer she had been looking for. “I love to garden and this child drew pictures of a beautiful flower garden and a flower garden that had been taken over with weeds. He explained that cancer was like the weed and it needed to be cut out or sprayed with something so it would go away and the beautiful flowers could grow again,” Mueller said. The analogy worked, for her students and for herself. “Cancer is like a weed. If you leave it alone, it will take over and destroy, but if you do the right things to treat it, you can blossom again and lead a long life,” Mueller said. This realization arose in the middle of her journey, at a time when her hair was beginning to fall out and her doctors were worried her skin was going to start burning and peeling due to the chemotherapy. Her students wanted to know if her hair would be pink or rainbow when it grew back. Again, humor and lightheartedness carried her forward, day after day. 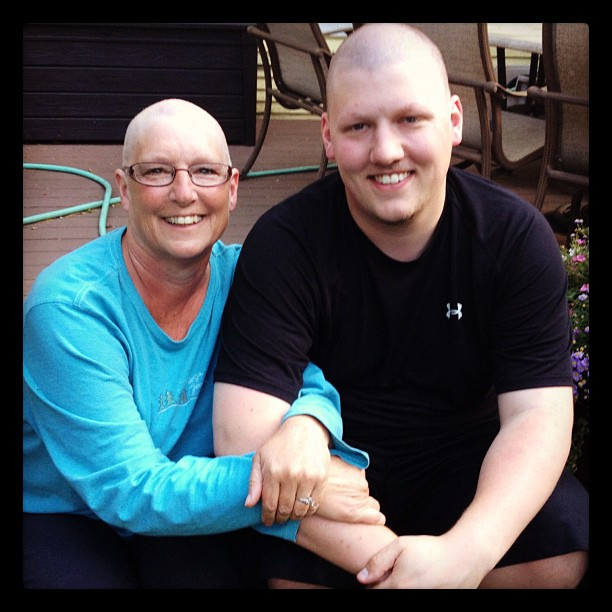 After shaving his head with his roommate, Will Mueller supports his mother, Nancy Mueller, during her battle with breast cancer. In April, she underwent a lumpectomy to determine if her cancer had spread. Fortunately it had not, but she would have to endure four chemotherapy treatments every three weeks throughout the summer, and then 33 radiation treatments. These phases of many surgeries and treatments felt “like a dark tunnel,” a tunnel she had no choice but to walk through. “I knew it might be black in that tunnel for a while but that before I knew it I would begin to see the light on the other side,” Mueller said. Mueller’s life has been changed forever. “I will embrace each day and its beauty. Life is full of mystery and magic and I will look to and celebrate that each and every day,” Mueller said. Without the support of family and friends, of community and faith, her recovery would have been impossible. “I was constantly wrapped in love and support by so many family and friends,” Mueller said. The Race for the Cure is a manifold of meaning to Mueller now. “This year is especially important to me personally as I will have finished my own journey through breast cancer,” Mueller said. “It is an inspiring day… The atmosphere is charged with hope, support, laughter, tears, encouragement, fun, and smiles,” Mueller said. 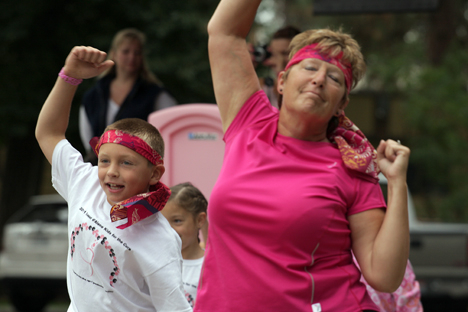 Volunteering again at Race for the Cure was the first goal she made after hearing she had cancer. Now she can make that first goal. Now she can line up on the starting line with all of those who made it and the memories of those who didn’t, as a woman in pink, and as a woman whose story was never just about herself anyway. Melissa Mueller, left, shave her mother, Nancy Mueller’s hair, right, on the Fourth of July. Beautiful writing, Shane. You truly have a gift.